The durable and resilient stand up desk. 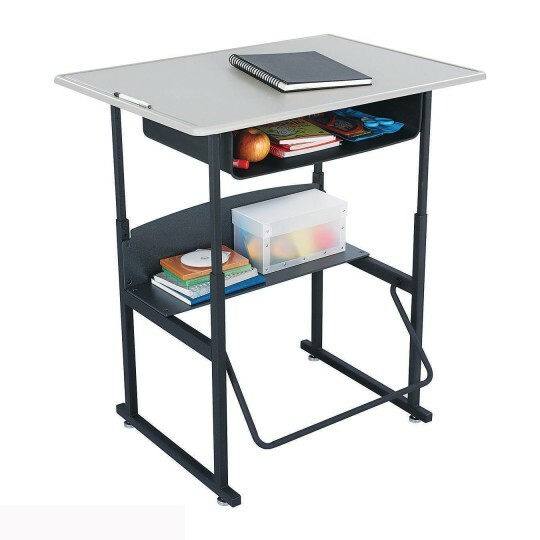 AlphaBetter® Adjustable-Height Stand-Up Desk with Swinging Footrest and Book Box features a standard MDF beige desk top and durable thermoplastic laminate coating for resilient impact and chemical resistance and a steel base with black powder coat finish for durability. Standard top measures 36” x 24”. Has an adjustable nylon base leveler for stabilization and easy movement across smooth and carpeted floors. Phenolic resin open shelf provides easily accessible storage area for school supplies and personal items. Adjustable desktop height with 14 settings ranging from 26” to 42-1/4” in 1-1/4” increments. The Patented Swinging Pendulum™ Footrest Bar allows students to redirect excess energy and engage in continuous motion, while potentially increasing calorie burn, productivity and focus. Pairs well with AlphaBetter® Stool (FN3927-sold separately) to allow for a break from standing as desired. Desktop measures 36” x 24” x 5/8”. Greenguard certified. Made in the U.S.A.